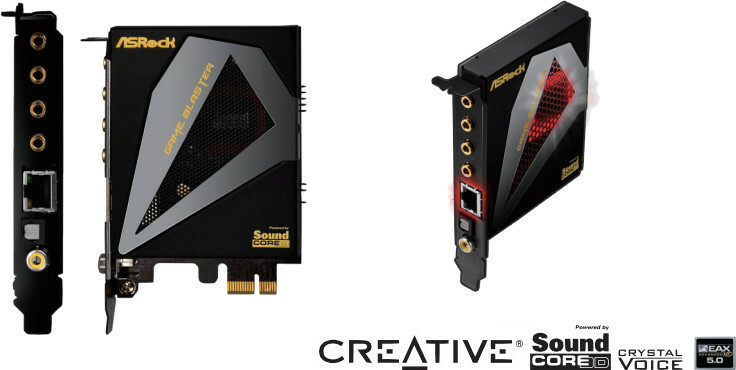 Taiwanese motherboard manufacturer ASRock partners with Creative to produce the top gaming sound card - Game Blaster. It is quite easy to guess that the ASRock Game Blaster uses Creative Sound Blaster's Sound Core 3D audio. From the name, Game Blaster, one would relate it to the leader of the sound card, Sound Blaster. The Game Blaster is powered by Creative very own Sound Core3D™ quad-core audio and voice processor. There is a scout mode to allow you to hear where your enemies are coming from. There's also a Broadcom Gigabit LAN that focuses on high performance in internet gaming, and uses low power consumption. good but royalties to thx and low volume sales likely.